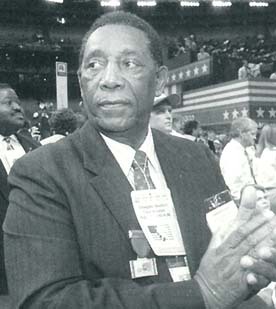 James Charles Evers was born on September 11, 1922 in Decatur, Mississippi to parents Jesse Wright and James Evers. Growing up in Mississippi during the era of Jim Crow, Evers witnessed the effects of racial discrimination and prejudice firsthand. At the age of ten, he witnessed a horrific lynching of a black man who had been accused of insulting a white woman. This lynching left a lasting impression on Evers, who vowed, along with his younger brother, Medgar, to exact change for the blacks of Mississippi. At the age of seventeen, Evers joined the U. S. Army. He served overseas during World War II, first in Australia and then in the Philippines. When he left the Army in 1946, Evers returned home to Decatur. During the 1940’s, Evers began his life-long commitment to the civil rights movement when he, along with Medgar, organized voter registration drives throughout Mississippi. He enrolled at Alcorn Agricultural and Mechanical College (now Alcorn State University) where he graduated in 1950. While at Alcorn, Evers captained the school’s football team and was student body president. During his summers, however, he traveled north to Chicago, Illinois with his brother Medgar in search of work. In 1951, Evers married Nannie Laurie and they moved to the town of Philadelphia, Mississippi. Evers found a job teaching history and coaching high school football in the nearby town of Noxapater. Evers left teaching when the school in which he taught refused to accept his daughter as a student. After his short stint in teaching, Evers engaged in many different business pursuits over the next several years. He worked as a funeral parlor director, cab-driver, disc-jockey, and even as a bootlegger. Evers was made the National Association for the Advancement of Colored People (NAACP) State Voter Registration Chairman in 1954. He remained in Mississippi until 1956, when he was run out of town by angry whites who feared Evers’ political activism. Evers then moved to Chicago and became a successful nightclub owner, disc jockey, and real estate agent. He lived in Chicago until his brother Medgar was assassinated in 1963. Upon his return to Mississippi, he took over his brother’s position as field director of the NAACP in Mississippi. As field director, Evers organized and led many demonstrations for the rights of African Americans. In 1969, Evers was named “Man of the Year” by the NAACP. In the same year, he won election as the mayor of Fayette, Mississippi. Evers was re-elected as mayor of Fayette in 1973 after an unsuccessful bid for the governorship of Mississippi in 1972. He served as mayor until 1981, and again from 1985 to 1989. Evers also ran for a U.S. senate seat in 1978. Over the years Evers has been an outspoken proponent for the rights of African Americans. He has also served as an informal advisor to Presidents John Kennedy, Lyndon Johnson, Richard Nixon, and Ronald Reagan. Charles Evers still lives in Mississippi and is currently the station manager of radio station WMPR 90.1 FM in Jackson, Mississippi.